I made a new top. 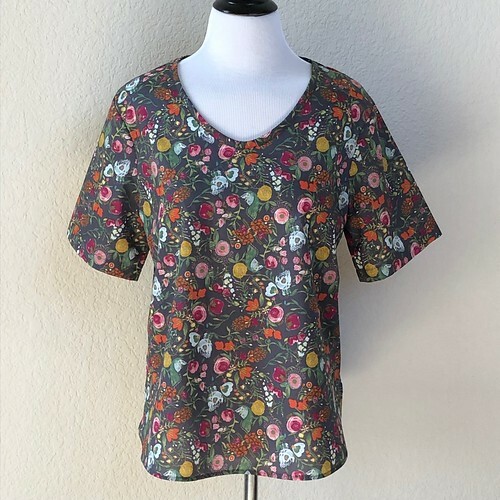 This is the Kobe top by Papercut Patterns. I made it in an Art Gallery Fabrics Voile which, while lovely to work with, has just barely enough drape for this particular pattern. When I do it again, I'll probably use a rayon so I can get more drape. The pattern worked up really quickly. The back pleat section is a bit complicated, but there's an online tutorial with more pictures than the pattern directions have and that helped me figure out what to do. 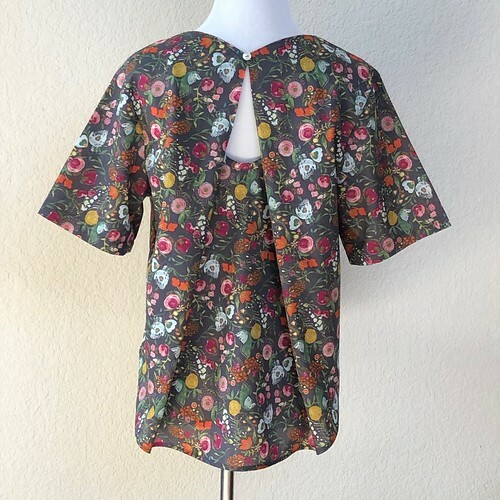 I did make a couple of changes to the pattern (since that's what I do): I took off two inches from the back length while leaving the hem shaping the same, and I added three inches to the front length and reshaped that hem to a shirttail shape. The back hem was still a little bit longer than the front, but not as dramatically as the pattern was originally, and the front isn't cropped. When I make it again (and I will), I might also shorten the sleeve a bit. I haven't tried it back on since I hemmed them so I do need to double check that. The voile is really great fabric, slightly lighter weight and with more drape than Liberty Tana Lawn, but just as easy to work with. This is the fourth substrate (quilting cotton, voile, rayon, and knit) I've worked with from Art Gallery Fabrics and I've been very happy with all of them. Their fabrics aren't cheap, but in this case, you get what you pay for. I'm still working one side of my Granny Goes Large each evening. It's not super fast but it is forward progress and I'm not injured. I've worked five rounds since you last saw it. I haven't measured the blanket lately but it's getting to a decent size. I plan to just keep crocheting until I run out of all my yarn except the border yarn, and then I'll finish it off with the border. As I run out of colors, I'll just drop them from the rotation (I didn't have equal amounts of all the colors when I began). This particular repeat will be missing a color that was in previous repeats, and the next repeat will lose at least one more color. This probably isn't the most scientific way to make a blanket, but it's working and I think it will be a happy, bright blanket when it's finished. 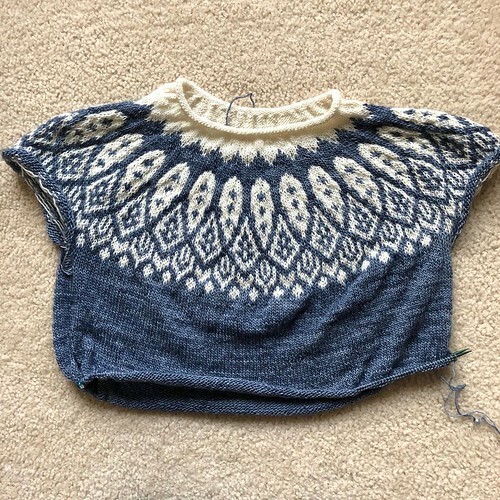 I've gotten a lot of work done on the body of my Sipila Pullover. I decided to steam block the top colorwork section just to check that it was going to smooth out nicely and I also tried it on, just to double check the fit. I'll admit that I was a bit concerned, so I'm glad I checked everything, but I'm happy to report that all is right with the world. The colorwork yoke steamed out nicely and it's laying flat and I'm happy with the fit. That's given me the motivation to get it finished! Also, it's cold outside so I need all the sweaters! 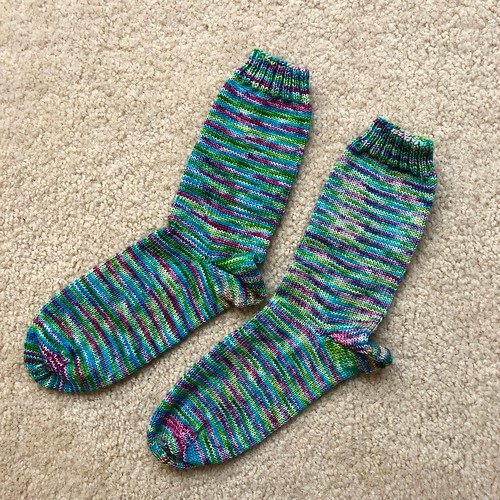 I finished my Mermaid socks over Thanksgiving week. (I decided at the last minute to take a break from the blog, but I'm back now.) These are just plain vanilla stockinette socks with a Fish Lips Kiss heel knit in Western Sky Knits Magnolia Sock in Mermaid. I kept them as simple as possible so the colorway could shine. I've got a little bit of yarn left and I am trying to get a pair of footie socks out of them. By using a contrast color for the toes and heels I think I might be able to just squeak out a pair. I'll show you how it's going later this week! 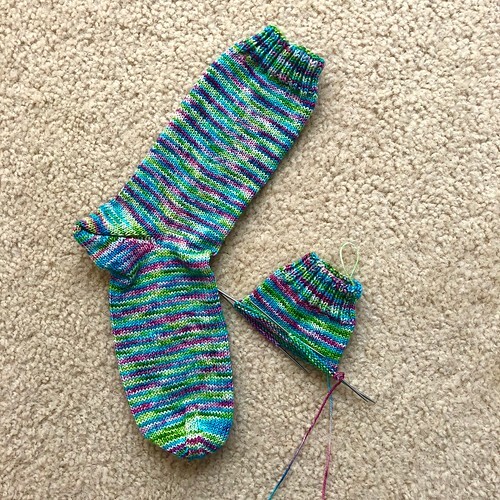 I've finished my first sock of the Mermaid pair, and started the second one. I haven't gotten very far on the second one but for some reason it looks darker to me than the first one did. There just seems to be less of the little white bits in it. It doesn't bother me, and I've seen this happen before with handdyed yarns, it just seemed to get darker right after the ribbing. Who knows, it could lighten up a bit as I go on, or the whole second sock might be a darker shade than the first. I guess it's just one of the mysteries of sock knitting. On an only slightly related note, does anyone else feel the need to knit more socks when the weather gets cold? 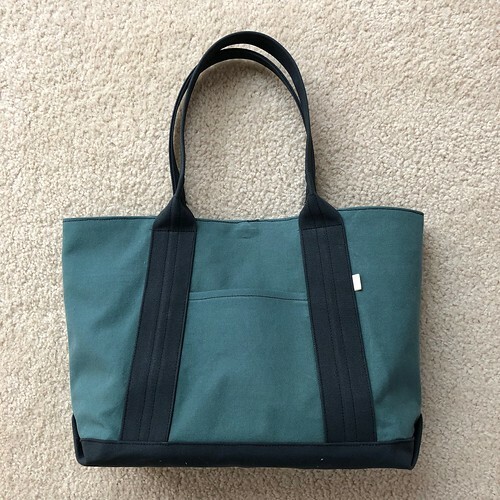 Earlier this year I ordered a pattern and kit for a tote on Etsy. (I may have made a special request for the color because I don't see it in the listing.) I finally sat down and made it and I think I found a new favorite tote pattern. The pattern comes in three sizes (I made the Medium) and is extremely well written. I made a mistake making it because I totally misread a diagram but that's completely my fault. If I had read the sentences below the diagram (the ones explaining the diagram) I could have also avoided the mistake, but apparently I felt that I didn't need to read the directions. I'm not going to point out what the mistake is because I believe that 99% of the time if we don't point out our mistakes no one else ever notices anyway. 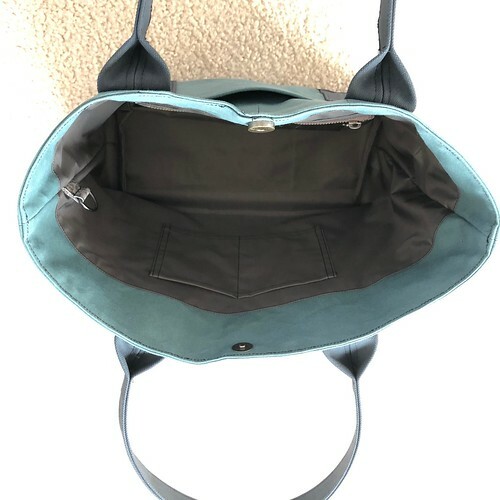 There are two slip pockets and a zip pocket inside the tote and one slip pocket outside the tote. The fabrics sent with the kit are seriously heavy duty canvas and I think that (along with cockroaches, of course) if the apocalypse were to happen today, this tote would survive. Yeah, it's a pretty sturdy tote. I used a Jeans needle in my sewing machine along with heavy duty thread and it had no problem sewing through all the layers. It was a fun project and I'm really happy with the finished bag, even if I didn't quite do it right. I will definitely be making some more of these - I've been checking out some of the Home Dec canvas prints online! I'm working along on the body of my Sipila. It's blue all the way to the hem of the body, so I won't be slowed down by color changes. The oversized fit of the sweater means it takes a while to see progress, but I am getting there. There's more colorwork in the sleeves, but they aren't oversized so they should actually go pretty quickly. In the meantime, I will just keep going in blue circles! 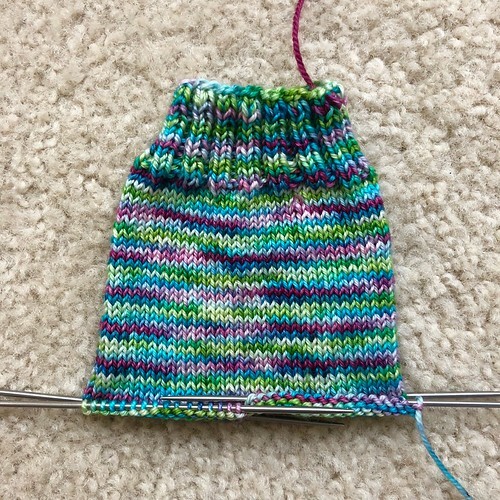 I'm just past the heel turn on my first Mermaid sock. I just love this colorway, but it's so busy I'm glad that I kept the stitches simple. Hand dyed multicolored yarns are fun to buy, but it took me a long time to figure out how to use them. They have a tendency to look better in the skein than they do in a project. I don't worry about it too much in socks but I tend to avoid them in sweaters. Until this year. Apparently this year is my year of the variegated sweater. I can't explain it, I just keep knitting them this year. 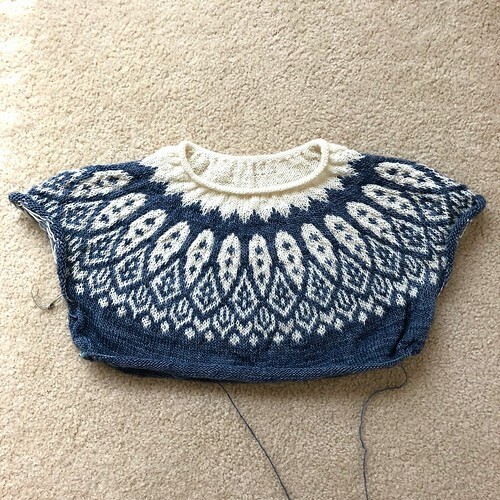 I've been getting a lot of work done on the front of my second Relax pullover. I'm almost to the underarms now. I've got all the row numbers marked from the back shaping so I don't have to stop and measure, I just have to knit to the correct row. I know that not everyone likes to use row/round counters, but I almost always use them, especially when I'm making two pieces that have to match like a front and a back, or sleeves, or a pair of socks. 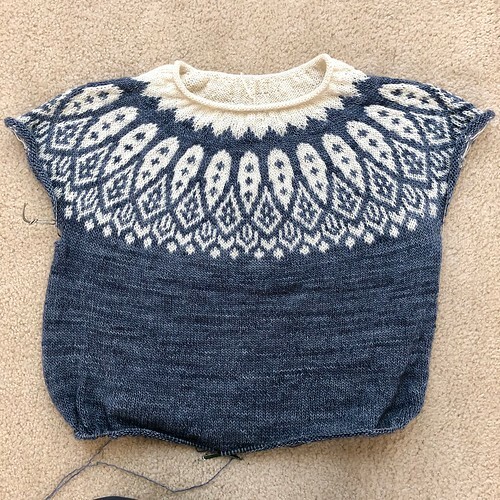 I used a row counter on Sipila for the yoke section to keep track of my chart progress, but now that I'm knitting the body, I'm just knitting without a counter. I don't have anything that needs matching to another piece right now because the body is knit in the round. When I do sleeves, I'll use the counter again. I really don't use the counter in crochet but that might have more to do with the kind of crochet I do than crochet itself. Do you use counters or not? If you don't use them, how do you keep track of where you are and keep your pieces matching? Have a great weekend! It got cold here overnight. I got out the fuzzy running tights for the first time this morning and tonight we're under a freeze warning. Stay toasty! Since I last showed you my Granny Goes Large blanket, I've added two more rounds (green and pink) and I'm still able to crochet without pain! I'm still trying to do a little bit every day without getting crazy. 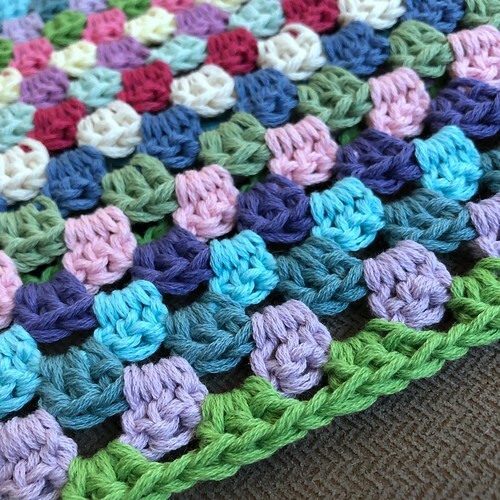 This doesn't make for very dramatic blog posts, but if I can crochet without pain, I'm happy. 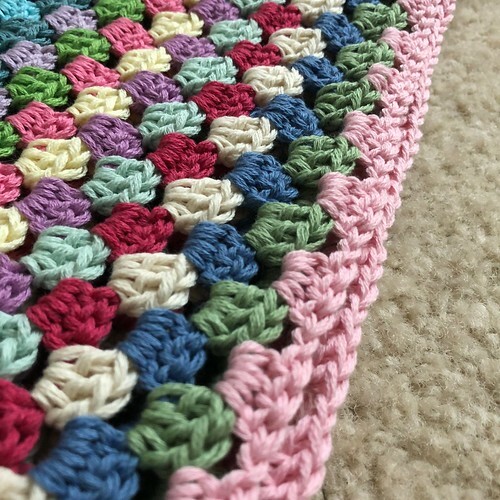 I have another crochet blanket planned after this one so I'm being very careful to build up these crochet muscles gradually. Slow and steady will get me there faster than quick and injured. I've been knitting away on the body of my Sipila! I've put the sleeve stitches on holders and I'm just working on the body now. I've also added a second skein of the blue (it's Flycatcher Blue in Madelinetosh Tosh Merino Light in case you're curious) so I can alternate skeins. The knitting is easy but the fact that this is an oversized pullover means it takes a while before I see progress. I think this is what Netflix was invented for. Over the weekend I decided I needed a smaller project. Both of my sweaters are just stockinette, but they're also both oversized and I'm alternating skeins for both of them. 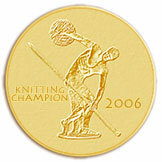 I wanted something small, fast, and knit from only one skein. I cast on a sock. 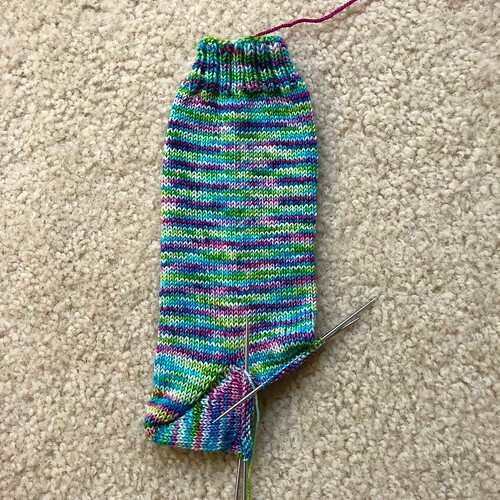 It's a simple stockinette sock, nothing fancy. 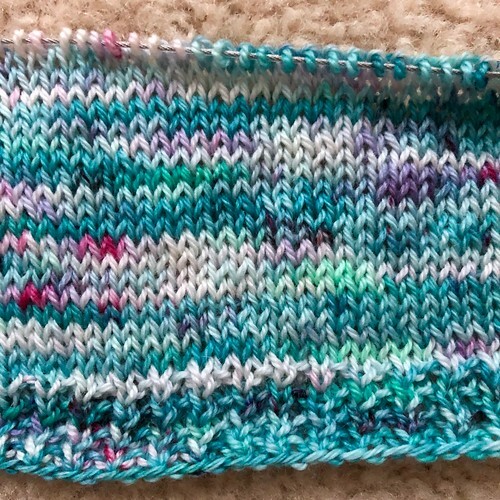 I'm just letting yarn do the work (Western Sky Knits Magnolia Sock in Mermaid). 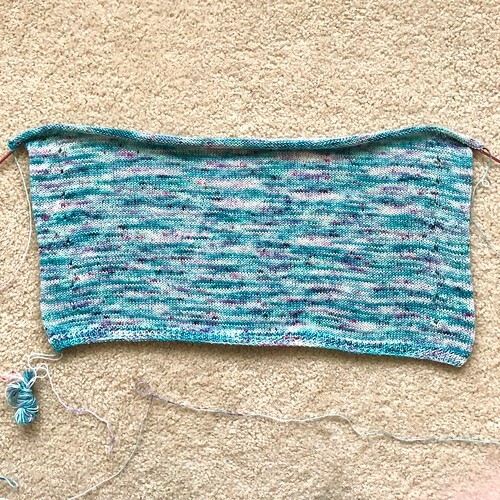 I'm still working on my big pullovers, but it's nice to see the amount of progress I get with just a little bit of knitting. Sometimes you need a little project! Even though most of my time lately has been devoted to knitting my Sipila, I have started the front of my second Relax. It's been sitting on the sidelines, but now I hope to divide my time evenly between the two sweaters. I almost never have two sweaters on the needles at once, but that's just the way it worked out right now. As soon as I finish the first one, I'll go back to one sweater at a time again. I just feel like I get more done when I have one big project and one or two small ones.